With over 1 billion users, Facebook is a great platform for reaching your company's ideal customer. But how can you turn that audience into actual paying customers? The key is engaging your fans and drawing them to your website before guiding them through your marketing funnel. Learn the process for increasing your reach to generate leads and close sales all through Facebook use. 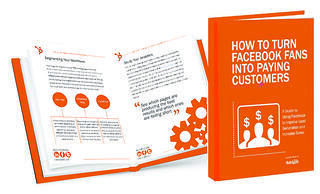 Download your free copy to start learning how you can turn mere prospects into customers through your company Facebook page today.